“Goodbye” might be a symbol of the end of love for most people, but for a lèse majesté exiled junta critic, Nuttigar Woratunyawit, saying goodbye is an act of love. In April 2016, soldiers arrested Nuttigar Woratunyawit and seven other individuals and detained them incommunicado. 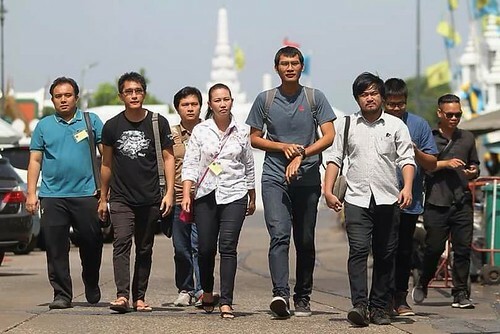 The authorities alleged that she committed sedition for running a Facebook page “We Love Gen Prayut” mocking the junta head Gen Prayut Chan-o-cha. The authorities later accused Nuttigar and another suspect, Harit Mahaton, of lèse majesté. The evidence that lead to the charge was screen-captures of a private Facebook chat between the two. She had been in jail for over two months before the Bangkok Military Court granted her bail in July 2016. And in January 2018, she revealed that she had decided to flee the country and now is seeking asylum in the US. 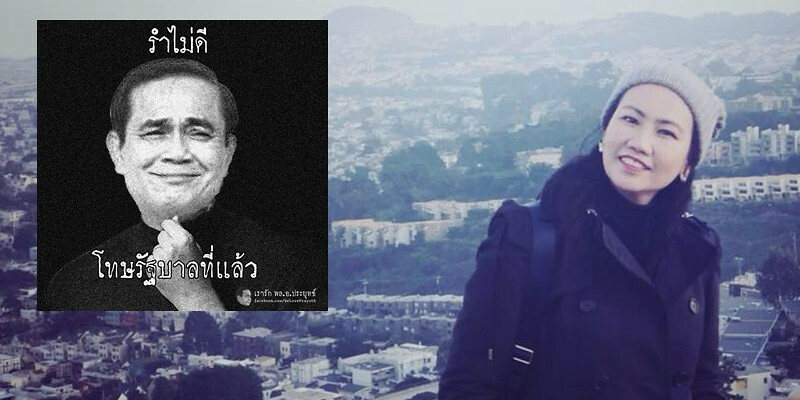 Nuttigar told Prachatai that she has always been thinking of seeking asylum in the US, because it is a multicultural and multiracial country where people respect each other’s beliefs and live peacefully under democracy. She believes that in this land of hope, she will never starve to death. However, her decision comes with a huge cost. On Valentine’s day this year , Nuttigar is unable to spend time with the person she loves the most -- her mother. On the day that soldiers raided her home and arrested her, she was alone with her mother. She recalled that during her detention, her mother, 80, always came to court whenever she was summoned and visited her in prison every day. The prosecution also had an enormous effect on her mom’s mental health. Her mother is one of Nuttigar’s main reasons for fleeing Thailand because she does not want to see her mom living in such condition again. Her mother was also glad of her decision, although it has taken them half a world away from each other. “At least I’m safe, that’s what my family wants the most,” said Nuttigar, adding that she always contacts her family through video calls which is far better than talking from behind bars. As a Thai living under a semi-authoritarian regime, freedom and liberty in the US is what Nuttigar has always dreamed of. However, she does not have a plan to take this opportunity to continue her political movement, but she rather just wants to have a new life. “People in Thailand usually think I’m fortunate to have got out. I really understand and sympathise with them because at this time it’s difficult for everyone to freely express their opinion, especially on politics,” Nuttigar stated. On Valentine’s day this year, Nuttigar wants to thank everyone who has sent her supporting messages online. She also sends good wishes to the ruling National Council for Peace and Order (NCPO). “ The almost four years that the NCPO has been in power have proven that the NCPO has not been able to create reconciliation in Thai society, has not been able to eliminate corruption and does not have the ability to move the Thai economy forward. Plus, they have made the country’s image even uglier in the eyes of the world. “The NCPO has jeopardised the country with corruption without accountability, intimidation of the people and the detention of those who oppose it. Nowadays, Thailand has become a country without a future and without hope,” Nuttigar said, adding that the NCPO should cease its attempts to prolong its power and should hold elections as soon as possible.